Wow, has it really been two weeks since my last post?! I honestly don’t know where the time has gone, I have so much to tell you but unfortunately the blog has had to take a bit of a back seat recently *sob*. As I mentioned a while back, I’ve been accepted onto another degree course, this time a Master of Science degree in Regulatory Affairs (I know, it’s a bit of a mouth full! ), which I am doing alongside my full time job in Regulatory Affairs. “It’ll be easy to do both” she said..famous last words! In fairness, it would be totally manageable if I didn’t throw 3 horses into the mix that live at home.. So top that with an impending coursework deadline (3 pieces of, to be precise) and all of the seasonal activities that need to take place, it’s fair to say I don’t have much time in the day to sit down with a cuppa let alone anything else! So…I’m starting to see the light at the end of the tunnel. With the coursework and actual work at least, Christmas is in sight and I can’t wait for a bit of time off to do nothing, see the daylight (leaving home in the dark, mucking out in the dark and getting back home in the evening in the dark is starting to get a bit tedious! ), get some fresh air in my lungs and actually do something with my family, friends and horses without stressing out about what I should be doing! …not quite there yet! As I said, the most important stuff is on it’s way to completion, but I am absolutely nowhere near completion with my Christmas shopping or any other Christmas activity! I do finally have my tree up and house decorated (you may have seen on Instagram that I took a trip to a local family friend’s farm to pick our tree and I have had a few hours out – for my own sanity – to make a Christmas wreath) but presents – well that’s another story. So if you’re like me and have left things almost to the last minute, don’t fear! I have a huge post ahead of wonderful gift ideas, whether they be stocking fillers or big presents. Boys – now is a good time to pay attention and have a read…I’ve even got some amazing exclusive discounts for you so there’s no excuse (Ladies, this is a great excuse if you need to treat yourself whilst present shopping!). I’m going to do a whistle stop tour of my top gift picks simply because there’s so many to tell you about! But rest assured, I’ll be bombarding you with posts in the lead up to Christmas so you’ll be sure to see some of these featuring in more detail in my ‘top picks’ section! These are perfect for any lady that wants to keep a bit of country style in her evening wardrobe. I love my M&G clutch (see my Mackenzie & George post for more details on the clutch) and use it for so many things, not only is it ideal for evenings out, it’s perfect for days where you don’t want to lug a big heavy bag around. I used mine at Badminton Horse Trials this year for that very reason. It’s so versatile that you can even undo the wristlet and attach it to your belt loops – no carrying required! Even better, you can take advantage of the personalisation service and have a truly unique, useful, stylish and timelessly classic gift for your loved one. Sold? Well you should be! But if not, my wonderful friends over at M&G are offering my lovely readers a massive 20% off all M&G clutch bags! Click here to shop and use the code AGIRLABOUT for your exclusive discount. I also have to mention the leather key fobs from M&G here..perfect for everyone in the family, they are available in a variety of colours and can be personalised with either gold foil or blind embossing – a very stylish stocking filler! I love Holland Cooper, we all know that. The cable knit fur pom pom bobble hats have been a staple in my wardrobe since they were first launched and I don’t think you can have too many colours (especially when they seem to go for a walk into your Mothers wardrobe!) but you may have noticed a new hat on the rack recently. The angora bobble hat offers absolutely everything that our old HC favourite does, but I think it’s that little bit more luxurious. It’s super warm, very classy and even has a detachable fur pom pom! They’re a little more exclusive too..these beauties are not available on the website so make sure you call the HC office to order yours (01608 658063). Another firm favourite of mine – HoC’s shooting socks are literally a daily staple to accompany my wellies and I can’t get enough of them. All of the shooting socks make fantastic Christmas gifts for anyone, Ladies and Gents and I couldn’t recommend them more highly (Something to Knock your Socks Off!) but what I really want to recommend is the cashmere collection. If like me, your feet are always cold (or resemble ice block which is probably more accurate) these are for you. Super cosy but not at all bulky, the cashmere socks are perfect for pairing with more fitted boots like my absolute favourites from Fairfax & Favor (a very special gift idea!). I am also in love with the cashmere bed socks with I live in at home and are so much nicer than my slippers. Receiving socks for Christmas is a typical stocking filler but these gorgeous HoC socks are far from typical – everyone will want a pair! What’s even better, HoC are spreading the festive cheer to all A Girl About Country readers and offering you 20% off when you use the discount code cosycashmere so what are you waiting for – click here to get yours before they all sell out! Who doesn’t love a good mug? We all know I love my Doris ones (Top Pick – Doris & Co Mugs). Again this is a fantastic stocking filler for everyone particularly those hard to buy for in-laws, aunts, uncles or grandparents, as well as those that are very easy to buy for (James – if you’re reading I am always looking to expand my collection!). I also wanted to mention the new jute bags that Doris & Co have bought out. Again, another great stocking filler gift that everyone will want to have, I use mine for a lunch bag and use it every day, but they are so versatile that you could take them out shopping, use them to store books and magazine, carry horse treats..anything really. There’s a particular candle that everyone seems to opt for at this time of year but once you have seen Wingfield Digby’s offering you will absolutely have a new favourite. I am currently writing this post surrounded by Winter Spice – not only does it smell amazing, it’s doing a very good job of making me feel festive as well as giving a calming atmosphere – which let me tell you is no mean feat at the moment!! It also looks fantastic, I love the pheasant feather decoration which is perfect for any country home at any time of the year. P.S. it also comes in a wonderful presentation box so it’s far more than just a candle! I will be stocking up on these throughout the year because they are just so gorgeous! But more about the fabulous Wingfield Digby in later posts. This is definitely something I have to talk more about, so watch out for my Top Picks later in the week but these tops have got to be the best gift idea for any equestrian lady. Not only do they look great, the Tek Conquest Top has to be the most practical sweater I own. With performance at the forefront of the design process, these are perfect for keeping the cold and rain out but equally are great for internal climate control and keeping moisture away from the skin. I have 3 of these now and wear one everyone to do anything with the horses – no more getting hot and sticky whilst riding but shivery cold when you’re done – these tops have got you covered! I know I am totally biased but the ultimate gift for any country lady has to be something from Fairfax & Favor. Luxury, style and elegance with a country twist but that is smart enough to take you anywhere – what more could a girl want?! I LOVE my Salisbury Purse, it’s such a great size perfect for harbouring all of your receipts!) that I use it as a clutch as well as a purse. Trust me – boys if you want to make your girl’s Christmas special – this is what you need, and at the moment the Fairfax & Favor team are offering a very beautiful gift wrapping service (I’m trying to justify treating myself and having it gift wrapped!). 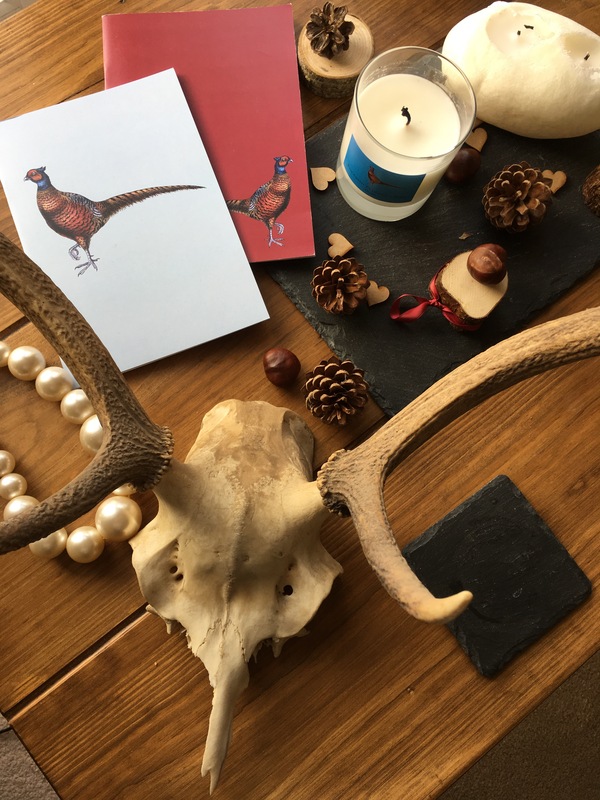 Stylish and contemporary stationary and homewares that has been inspired by rural living pretty much sums up Pheasant Plucker & Son. I couldn’t think of a better stocking filler than one of their gorgeous notebooks – I have a couple of the pheasant ones which are full of blog plans and ideas! I also love their scented candles which are really relaxing and their handmade soap which are such fantastic value that they’re perfect for those little extras, or even secret Santa presents! Something a little different and not yet on everyone’s radar but trust me, any country lady worth her style will be wearing a Frank & Grace snood soon. Designed and handmade by country lady Daisy, these designs are not only stunning but also fit for purpose – this snood was actually designed by Daisy to keep her warm whilst out shooting so you can be sure its capable of standing up to the challenge! Lined with the most beautiful tweed and complemented with faux fur that’s so snuggly you wouldn’t believe it’s faux, this is a sure staple in anyone’s wardrobe – perfect for those chilly post Christmas lunch walks! I’m also a huge fan of the Dora gilet – it’s definitely on my Christmas list! How to single one thing out as a gift idea from Hiho Silver? It’s virtually impossible because absolutely everything has been so thoughtfully designed and skillfully made but I love the rose gold double snaffle bangle – it’s my current favourite and complements the cherry roller bangle that I am also lucky enough to own, so well. Really hard-wearing and able to take a battering yet delicate and intricate that it’s perfect for any lady that has horses and those who don’t!). If you are looking for gifts for the special chap in your life – my top pick is the Silver Shotgun Cufflinks, a sure fire hit for any country gentleman. How about booking a mini break at the amazing Dimpsey Glamping (The Dimpsey Experience) – again James, if you’re reading this is a hint! How bout a mini break for a special gift – Dimpsey Glamping is the perfect place for cosy winter and summer) retreats! There will definitely be more gift ideas on the blog over the coming days but I think if you pick any of the above you’re on to a guaranteed Christmas winner. Any gentlemen that may want to get in their Lady’s good books, avoid the Soap & Glory or the standard perfume/chocolates combo and go with one (or more if you’re feeling generous!) of these ideas. Previous PostThe Dimpsey Experience Next PostHello 2017! House of Cheviot Shooting socks are my absolute favourite – they are so warm and perfect for takings my beautiful spaniels for their well deserved country walks. Fantastic gift guide – shame I didn’t find it before Christmas!